Our High School students who have embraced the #NEVERAGAIN movement are realists. 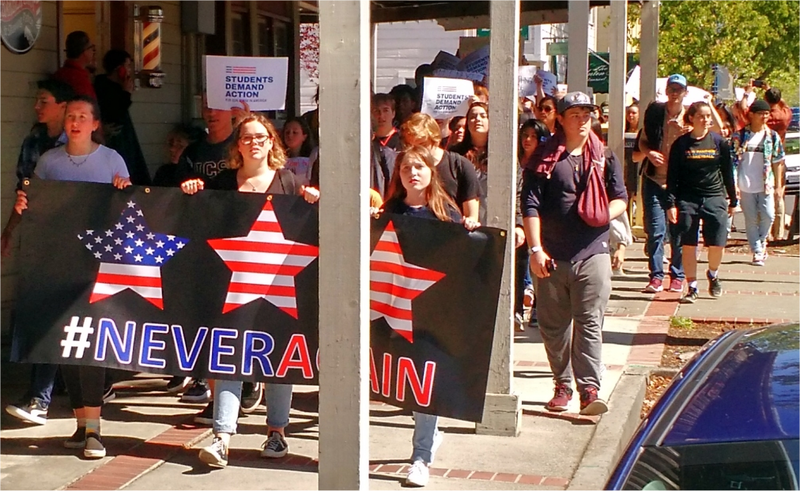 Gun violence is in fact a BENICIA problem … it is time to take action in EVERY city and town. Here are 21 links to Benicia Herald reports of gun violations in Benicia April, 2010 to May 16, 2013. Benicia police arrested a 17-year-old Liberty High School student they said made threats Wednesday to kill a classmate, and Thursday brought a gun to campus, Lt. Frank Hartig said. The youth’s identity was not disclosed, but he was accused of felony counts of terrorist threats and possessing a firearm on school grounds, as well as misdemeanor accusations of possessing a firearm with an obliterated serial number; of being a minor in possession of ammunition; possession of an assault weapon; and being a minor in possession of a concealed firearm, Hartig said. Solano County has been ranked sixth among California counties in youth and young adult homicides, said Marty Langley, policy analyst for the the Violence Policy Center, Washington, D.C. San Joaquin County topped the list that is based on 2011 statistics, and several counties reported no homicides among those 10 to 24, the age range that is the focus of the center’s report. Benicia police arrested a Benicia man early Monday in the Solano County Square parking lot after a police dog detected drugs in the vicinity of the man’s car. A search turned up drugs, weapons and a suspected incendiary device, Lt. Frank Hartig said Tuesday afternoon. A man sought by Benicia police in the Thanksgiving Day armed robbery of one woman and theft of another women’s car died early Tuesday of an apparent self-inflicted gunshot after a lengthy standoff on Treasure Island, San Francisco police said. Duncan Phillips, 29, had been the subject of a Benicia police search after he was suspected of attacking and robbing a 52-year-old woman at her apartment on the 900 block of Southampton Road, Lt. Frank Hartig said. Fast and Easy Mart, 1500 East Fifth Street, was held up Thursday night by armed robbers, police said. The lone clerk described the four assailants as African-American men in the 20s or 30s, wearing dark-colored bandanas over their mouths, police said. The 22-year-old American Canyon man identified as the suspect who exchanged gunfire with a Benicia police officer Saturday afternoon remained in Solano County Jail, Fairfield, after his arrest Sunday morning in Vallejo, authorities said Monday. Robert Flores Folster was arrested by Benicia police with help from Vallejo police at 1324 Lincoln Road East in Vallejo on Sunday morning, according to Lt. Mike Greene and Solano County Jail records. Folster has been booked on charges of burglary, endangerment of a child that could result in injury or death, attempted murder, carjacking, receiving stolen property and vehicle theft, according to jail records. All are felony charges. While bail of $1,050,000 was set for the first three charges, Folster is being held without bail on the latter three. A 17-year-old Benicia driver who ran a stop sign late Thursday was arrested on weapons and drug charges and was taken to Solano County Juvenile Hall in Fairfield, Lt. Frank Hartig said Friday…. A convenience store clerk was robbed at gunpoint early Tuesday, and the suspect not only demanded money from the register’ but the clerk’s wallet as well, Benicia police Lt. Frank Hartig said. The robber escaped on foot, and the clerk was not harmed, he said…. A Rio Vista man has been jailed after Benicia police accused him of two firearms violations following a traffic stop in a residential area…. Benicia Police arrested a 20-year-old Napa man early Wednesday and accused him of endangering a child when he negligently fired a revolver from his car while he on the 1300 block of Southampton Road, Lt. Frank Hartig said…. Benicia police said an armed robber entered a Southampton business Thursday afternoon and escaped with an undisclosed amount of cash. No one was injured in the holdup at Check Into Cash, 806 Southampton Road, police said…. A 49-year-old Benicia man has been arrested and a cache of guns, including an illegal 9 mm UZI assault weapon, were confiscated after Benicia police looked into reports Thursday that the man had been harassing a 20-year-old Martinez woman, Lt. Mike Daley said…. Benicia police on Friday arrested a Magalia, Calif., man after finding a handgun and tools commonly used for car theft in his possession. Police Sgt. John Daley stopped a 1994 Acura on the 900 block of Cambridge Drive at about 6:24 a.m. for an expired registration. After the stop police determined that the passenger, Brad Stancliff, 23, had a felony warrant for his arrest from the California Department of Corrections, according to a Benicia Police Department news release. A 28-year-old Benicia man who police said pointed a handgun at his roommate’s forehead Tuesday evening was arrested and charged with a felony. Lt. Mike Daley said the 34-year-old roommate called police and said the man had pointed the gun at him about 6:46 p.m. after they had been arguing…. The occupants of a Ford Thunderbird missing its rear license plate were arrested Tuesday night and charged with weapons and drug violations, Benicia police Lt. Mike Daley said Wednesday. Benicia K-9 Officer Damiean Sylvester noticed the Thunderbird was missing its plate and stopped the vehicle on East Fifth Street at the eastbound Interstate 780 on-ramp, Daley said. Sylvester spoke with the driver and passenger and discovered each had some prescription medicine but no prescriptions, Daley said. The passenger also had a substance police believe is methamphetamine, he said. “Friday the 13th” it was not, but a lone gunman wearing a mask popularized by the horror film series was deadly serious Wednesday when he entered a Southampton Shopping Center store. The gunman entered GameStop, 821 Southampton Road, at 9:54 p.m. wearing a white hockey mask, according to a Benicia police report. He brandished but did not point a black, semi-automatic-type handgun and demanded cash, then escaped with an undisclosed amount, police said…. A Benicia man was taken to an area hospital early Monday after police found him wounded by a gun he may have fired himself. The man was listed in critical but stable condition at John Muir Medical Center in Walnut Creek later that day, Lt. Bob Oettinger said…. Two 14-year-old Benicia High School students were robbed at gunpoint by four teenagers Friday night after the school’s homecoming game, Benicia police said Monday. A school administrator appeared shortly after the four robbed the two boys of their wallets, cell phones and a small amount of money, prompting the robbers to scatter, said Sgt. Scott C. Przekurat of the department’s investigations unit. The victims were walking through the campus after the game and had entered an outside hallway along the school’s A Wing at about 11 p.m. when they were approached by the four robbers, all described as wearing dark sweaters or jackets, dark pants, and flat-billed ball caps, Przekurat said…. Robert Semple Elementary School was placed on lockdown about 2:30 p.m. Thursday while authorities searched the area for gunmen who apparently were stalking a Benicia man and his girlfriend. Vincent Winnie, a 22-year-old Vallejo man, and three others were arrested by Benicia police at the Interstate 780-Interstate 80 interchange, Lt. Mike Daley said. They were still being processed by police at press time. The incident started before 1 p.m. when police received multiple calls of a possible drive-by shooting at the first block of La Prenda Avenue, Daley said…. BENICIA POLICE Lt. Mike Daley. Benicia police are asking residents to help them solve two incidents involving gunfire that occurred four days apart, Lt. Mike Daley said Wednesday. The first report was of shots fired on the 400 block of East L Street about 8:10 p.m. on June 29, Daley said…. Autopsies performed Wednesday on the two Benicia residents who died in an apparent murder-suicide confirmed that Walter Little, 48, and his girlfriend, Julie Strack, 49, both died of gunshot wounds, Solano County Deputy Sheriff Corey McLean said. Little, of 69 Vista Grande, died of an intraoral gunshot wound while Strack, of the same address, died of two wounds, one to the head and one to the neck, McLean said…. A 19-year-old Vallejo man who has been charged in connection with the 2008 murder of a Hogan High School student after a party at the Benicia National Guard Armory has filed a civil suit against Benicia, claiming permanent injuries were inflicted on him during his arrest. Richard Lindsey contends that when he was arrested at his home on in June 2009 in connection with the murder of 17-year-old Mark Anthony Harris in February 2008, he was fired upon several times, permanently damaging his left arm, shoulder, hand, and right leg. Lindsey also said he suffers post-traumatic stress syndrome, severe anxiety and emotional distress….